﻿The Author begins the book by following the military history of the influential men who would eventually become the Officers of the abovementioned battalions in 1916. Thus, he researches their war experiences during the Boer War and a more in-depth study of their operations during the Gallipoli campaign. There is an emphasis on the 13th Brigade Commander William Glasgow DSO. In between military life, Glasgow called Gympie Home, he lived there for much of his life after being born on a farm which was close to the Queensland Town of Tiaro. Tiaro is midway between Gympie and Maryborough . Glasgow was a friend of the A.I.F. stalwart, Brudenell White both of who become members of the Wide Bay Regiment Queensland Mounted Infantry, which was in part an early forerunner of the 2nd/5th Light Horse Regiment. 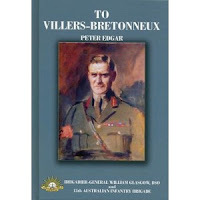 Follows the History of the 13th Brigade from its formation in Egypt in 1916 then onto the Western Front. Details its costly double encounter with the enemy at Mouquet Farm days after the Battle of Pozieres. The book details the Brigade’s operations into 1917 with difficult victories at Noreuil and Messines and an easier advance at Zonnebeke. ﻿On the 5th April 1918, they fought the decisive Battle of Dernancourt on the railway embankment and cuttings in Dernancourt, just south of Albert. The under strength Australian Brigades (numbering about 4,000) faced 4 German Divisions totalling about 25,000. Situated on the western side of the Nacre River valley, the Australians formed a defensive line at the railway embankment, from which they held back German attacks. The Australian Battalions soon found themselves outflanked by German forces to its rear. They were ordered to hold on at all costs but by midday the 48th Battalion was facing annihilation and the senior officer ordered a withdrawal. This action cost the 12th and 13th Brigades (4th Division) 1,100 casualties. On the 24th April 1918,﻿ the 13th Brigades' Commander Brigadier General William Glasgow received an urgent order to march his brigade towards the sound of the guns. A renewed German attack had taken Villers-Bretonneux, threatening Amiens and the Allied line of defence and the thrust towards Paris had to be halted at all costs. Glasgow had only a few hours to reconnoitre, plan the counter-attack, brief his men and send them forward to meet the enemy. These Battles resulted with the Brigades of the 4th Division halting the largest-ever German attack on Australian troops at Dernancourt on 5 April 1918. Following then three weeks later, the successful advance of the 13th Brigade and ‘Pompey’ Elliott’s 15th Brigade which were triumphant in the retaking of Villers-Bretonneux. 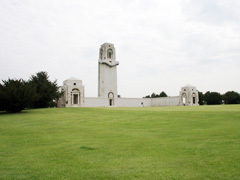 The Honour of which resulted in the Villers–Bretonneux Australian National Memorial being made at this site. The Memorial lists 10,773 names of soldiers of the Australian Imperial Force with no known grave who were killed between 1916, when Australian forces arrived in France and Belgium, and the end of the war. Not long after the end of the 1st World War Glasgow become a Senator of the Australian Parliament. In 1939, Glasgow was appointed first Australian High Commissioner to Canada. Returning to Brisbane in 1945 he died in 1955. Two tribute statues, which are located in Brisbane commemorate his life.